Following up from our snow post earlier; another question we get a lot in the winter is due to water coming in on the ceiling during the cold months. Snow and ice accumulated on your roof can cause ice damming – even on brand new roofs! Ice damming is when the heat from your home melts the snow on top of your roof (typically due to poor insulation) creating a lovely pool of water under the snow with no where to go. Roof shingles are not designed to have puddles of water sit on them – they are created to expel the water down to the gutters or downward off the roof. This is what causes water to come into your home when it is cold! Combine the cold (which contracts the shingles) and poorly sealed shingles – it could spell disaster for homes with old roofs! Poor insulation: An attic with inadequate or deteriorated insulation can cause ice damming. Even a hand size area can cause ice damming! This includes areas in the attic and the walls – mostly exterior, but even interior where it creates gaps. Lack of ventilation: A house with proper ventilation allows the necessary cold air to mix and cool the hot air from the house, which slows the snow melting down. Leaking gaps between the living space and the attic: These spaces allow extra heat to “escape” into the attic, which warms the space and melts even more snow. Accumulation and temps: You guessed it – The more snow that accumulates on your home combined with streaks of freezing temps can cause melting and back up but at larger proportions. Roof Angles: Some roofs are a basic design that allows water to flow easily off into the gutters. The more complicated the roof design with varying pitches, valleys and angles, the more likely that the water may back up into an exterior wall or be diverted into a small area that cannot handle expelling the water in a timely matter. The Sun: Believe it or not, even though the air is freezing, the sun is still doing it’s job melting. The surface temp of your roof is always warmer than the ambient air temperature. But when the air temp is still below freezing, there will be back ups. South facing slopes are going to melt faster with more sun coverage, and North facing slopes are going to melt slower and have longer lasting snow and ice in those areas. Gutters and Downspouts: Didn’t get around to cleaning out all those leaves this fall? Well, debris and build up in your gutter system is going to add to back up on your roof in the winter. Take a look for “steam pockets” on your roof – this happens when the surface temperature on the roof is higher than the ambient air temperatures creating evaporation = Snow melting on your roof when it is well below freezing. Icicles!! Aren’t they pretty? Pretty good sign that some type of melting is happening on your roof when it is still below freezing when you find your home covered in areas with really large icicles. Water on your ceiling when it is too cold to rain or coming out of your soffits is a definite indicator that your home has an ice damming problem. Water may also be in your basement where it has come into a wall that runs all the way down the height of your home. 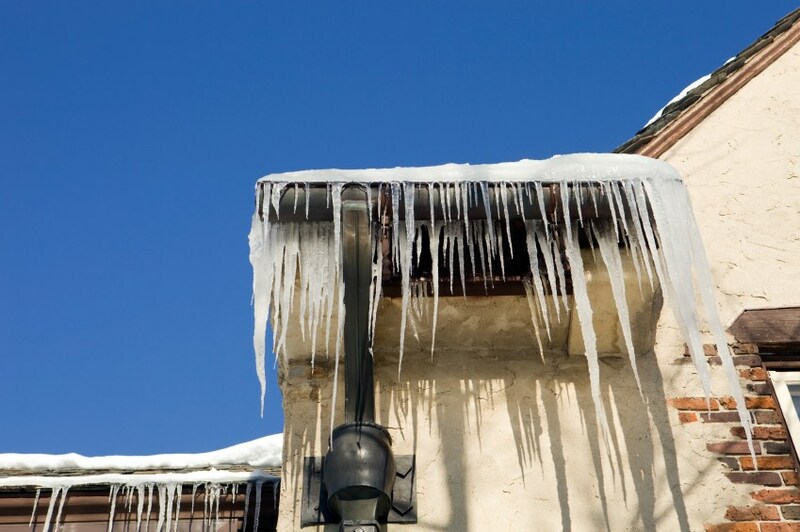 It is National Code to have Ice and Water barrier on your roof. Check out more about it here. It runs along your eaves to help prevent damage from snow and ice, but if the back up is substantial enough, even new roofs can suffer from the factors mentioned above. The same goes for flashing along your walls and chimney – it is designed to prevent water coming in while it is being expelled off the roof. But when snow and ice build up, water will always find a way to be relieved – above these barrier lines and into your home. The best prevention for ice damming is having your insulation checked and replenished regularly as well as having your roof maintained or replaced and gutters cleaned. 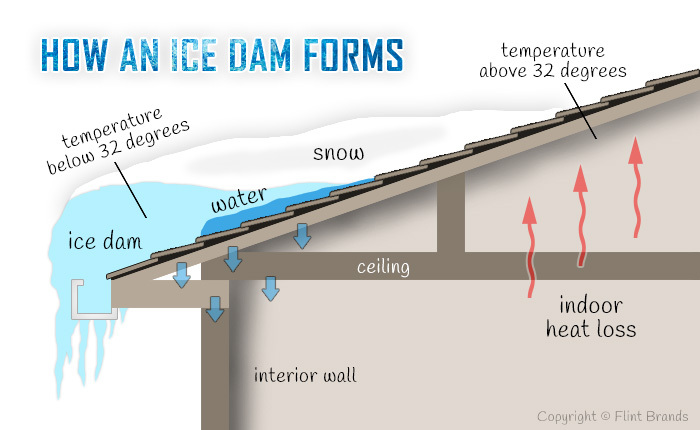 Not all ice dams are preventable being that they are an act of God with the weather and several factors, but taking the steps above can help alleviate any future incoming water. It is always best to have your roof properly maintained to check for vulnerable spots and seal damaged areas before the winter, and Roof Iowa is always here to help! We are voted Ankeny’s Best Roofer many years in a row as well as a Des Moines Metro Best Roofer. We have been awarded as a Master Elite and Certified Green Contractor as well as an Angie’s List Super Service award winner. We thank you for your trust!